Is it a fact or a myth? Do you know? 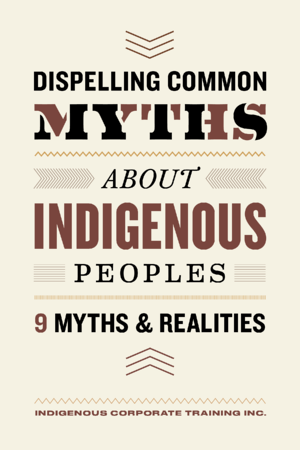 Our Dispelling Common Myths About Indigenous Peoples eBook takes a look at 9 myths and explores the realities of those myths. It’s a great resource for anyone who wants to look beyond common myths and misconceptions to the realities about Indigenous Peoples in Canada. Dispelling these common myths for participants of our on-site and public workshops is important work in gaining cultural competency. Further, this eBook will definitely give some insights to help readers inform themselves before that next community meeting. I want to know these myths!